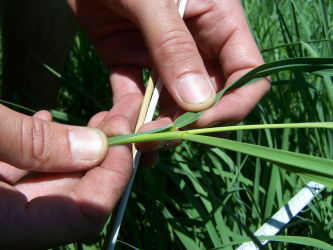 Reed canarygrass (Phalaris arundinacea) is actively promoted by university researchers and extension personnel as a forage species in the upper Midwest. Simultaneously, this native plant is listed as the number one invasive species in the state of Wisconsin because it forms monocultures in wetlands and waterways thereby decreasing biodiversity. Past research explored a low cost restoration approach—burning followed by spraying of a grass-specific herbicide. Results were highly variable, but we learned that under some conditions, this combination can effectively suppress reed canarygrass in wetlands. We are currently working with Dr. Michael Casler to address the question of how reed canary grass, which is native to North America, has become one of the most dominant invasive species throughout the United States. Improved varieties and wild populations from throughout the North American and Eurasian range of the species are being grown under identical environmental conditions to determine whether the invasion has been caused by changes in the aggressiveness of the species (i.e., the native North American populations are less aggressive than improved varieties or Eurasian populations). We are working with Dr. Michael Casler on another C3 forage grass, meadow fescue (Festuca pratensis). This project seeks to provide genetic and ecological information about meadow fescue, a grass with large agronomic potential—high productivity, palatability, and persistence. Toward that end, we are documenting the degree of genetic diversity found throughout the Driftless Region in Wisconsin, Minnesota, and Iowa, and studying the degree of interrelation and gene flow between locations in this region. Concurrently, we are documenting the ecological environments in which meadow fescue is found and attempts to quantify its role in the plant community. With this information we can help direct future breeding and propagation efforts, as well as evaluate risk of potential “ecological disservices” such as unwanted expansion into ecologically sensitive locations or local elimination of certain species. We hypothesize that these traits, combined with eutrophied wild lands, may render meadow fescue a potentially invasive plant, though there are currently no indications that it is spreading beyond managed pastures.